Very few parish churches can vie with that at Grantham (left) in size or the magnificent variety of its window tracery. Dedicated to S. Wulfram (Wilfrid), Archbishop of Sens the original church was built soon after the Conquest, but the mighty parallelogram of the present structure dates from the 13th century. 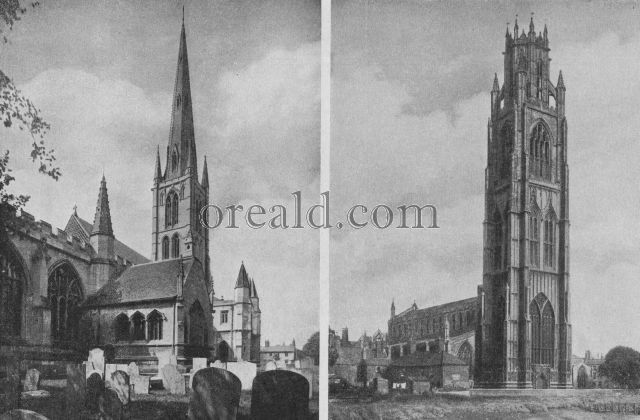 The very conspicuous spire is 14th century work, its height being 281 ft This altitude is seven feet less than that of the famous "Boston Stump" the principal feature of Boston's Church of S. Botolph (right), the most splendid example of the Decorated style in Lincolnshire. The "stump" of which the base is the oldest part of the church, is easily visible from the Norfolk coast for 40 miles distant.